They Came From This Determined Beginning... Moline Dispatch, Fri, Dec 22, 1967, 17 The Lady of Guadalupe, also called the Dark Virgin because she appeared as an Indian maiden that December day in 1531 to Juan Diego, an Indian. 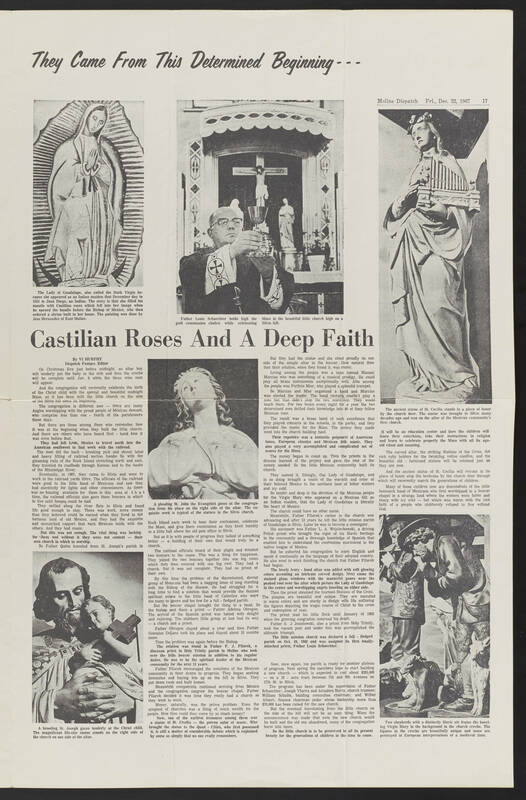 The story is that she filled his mantle with Castillian roses which fell into her image when he opened the bundle before the Bishop of Mexico, who then ordered a shrine built in her honor. The painting was done by Jess Hernandez of East Moline. Father Louis Schaechier holds high the gold communion chalice while celebrating Mass in the beautiful little church high on a Silvis hill. Castilian Roses And A Deep Faith By VI MURPHY Dispatch Feature Editor On Christmas Eve just before midnight, an alter boy will tenderly put the baby in the crib and then the creche will be complete until Jan 6 when the three wise men will appear. And the congregation will reverently celebrate the birth of the Christ child with the special and beautiful midnight Mass, as it has been with the little church on the side of the Silvis hill since its beginning. The congregation is different now - there are many Anglos worshipping with the proud people of Mexican descent, who comprise less than one - fourth of the parishioners these days. But there are those among them who remember how it was at the beginning when they built the little church. And there are others who have heard first - hand how it was even before that. They had left Leon, Mexico to travel north into the American southwest to find work with the railroad. The men did the back - breaking pick and shovel labor and heavy lifting of railroad section hands. So with the gleaming rails of the Rock Island stretching north and east, they traveled its roadbeds through Kansas and to the banks of the Mississippi River. Eventually, in 1907, they come to Silvis and went to work in the railroad yard there. The officials of the railroad were good to the little band of Mexicans and saw they had electricity for lights and other conveniences. As there was no housing available for them in this area at that time the railroad officials also gave them boxcars in which to live until houses could be had. They settled along the river flats in Silvis and found life good enough to stay. There was work, more money than they believed could be earned when they lived in the tortuous land of Old Mexico, and they had the exquisite and unmatched rapport that each Mexican holds with others. And they had music. But this was not enough. The vital thing was lacking for them and without it they were not content - their own church in which to worship. So Father Quinn traveled from St. Joseph's parish in A brooding St. Joseph gazes tenderly at the Christ child. The magnificent life size statue stands on the right side of the church on one side of the altar. A pleading St John the Evangelist gazes at the congregation from his place on the right side of the altar. The exquisite work is typical of the statues in the Silvis church. Rock Island each week to hear their confessions, celebrate the Mass, and give them communion as they knelt humbly in a little hall above the old post office in Silvis. But as it is with people of progress they talked of something better - a building of their own that would truly be a church. The railroad officials heard of their of their plight and donated two boxcars to the cause. This was a thing for happiness. They joined the two boxcars together into one big room which they then covered with one big roof. They had a church. But it was not complete. They had no priest of their own. By this time the problem of the discontented, devout group of Mexicans had been a nagging issue of long standing with the Bishop of the diocese. He had struggled for a long time to find a solution that would provide the desired spiritual solace to the little band of Catholics who were too many to ignore and too few for a full fledged parish. But the boxcar chapel brought the thing to a head. So the bishop sent them a priest - Father Adelma Obregon. The arrival of the Spanish priest was hailed with delight and rejoicing. The stubborn little group at last had its way - a church and a priest. Father Obregon stayed about a year and then Father Gonzalez DeLara took his place and stayed about 15 months more. Then the problem was again before the Bishop. The solution was found in Father F.J. Pilarek a diocesan priest in Holy Trinity parish in Moline who took over the little boxcar mission in addition to his regular duties. He was to be the spiritual leader of the Mexican community for the next 13 years. Father Pilarek encouraged the members of the Mexican community in their desire to progress. They began seeking homesites and buying lots up on the hill in Silvis. They put down roots and built homes. Meanwhile compatriots continued arriving from Mexico and the congregation outgrew the boxcar chapel. Father Pilarek decided it was time they really had a church so they went to work. Money, naturally, was the prime problem. Even the simplest of churches was a thing of much wealth for the people. How then could they come by so much money? Now, one of the earliest treasurers among them was a statue of St. Cecilia - the patron saint of music. Who brought the statue to the Quad - Cities who first possessed it, is still a matter of considerable debate which is explained by some as simply that no one really remembers. But they had the statue and she stood proudly on one side of the simple altar in the boxcar. How natural then that their solution, when they found it, was music. Living among the people was a man named Manual Marcias who was something of a musical prodigy. He could play all brass instruments exceptionally well. Also among the people was Porfirio Mier, who played a splendid trumpet. So Marcias and Mier organized a band and Marcias was elected the leader. The band recruits couldn't play a note but that didn't stop the two musicians. They would teach them. For two hours every night for a year the two determined men drilled their knowledge into 40 of their fellow Mexican men. The result was a brass band of such excellence that they played concerts in the schools, in the parks, and they provided the music for the Mass. The money they made went into the church building fund. Their repertoire was a fantastic potpourri of American tunes, European classics and Mexican folk music. They also played a very accomplished and complicated set of score for the Mass. The money began to count up.Then the priests in the diocese learned of the project and gave the rest of the money needed. So the little Mexican community built its church. They named it, fittingly, Our Lady of Guadalupe, and in so doing brought a touch of the warmth and color of their beloved Mexico to the northern land of bitter winters and icy cold. So tender and deep is the devotion of the Mexican people for the Virgin Mary who appeared on a Mexican hill as an Indian maiden that the Lady of Guadalupe is literally the heart of Mexico. The church could have no other name. Meanwhile, Father Pilarek's career in the church was advancing and after 13 years he left the little mission parish of Guadalupe in Silvis. Later he was to become a monsignor. His successor was Father L.A. Wojciechowski, a driving Polish priest who brought the vigor of his Slavic heritage to the community and a thorough knowledge of Spanish that enabled him to understand the confessions murmured in the native tongue of Mexico. But he exhorted his congregation to learn English and speak it continually as the language of their adopted country. He also went to work finishing the church that Father Pilarek had begun. The lovely ivory - hued altar was added with soft glowing colors accenting an intricate carved design. Next came the stained glass windows with the masterful panes near the peaked roof over the altar which picture the Lady of Guadalupe in the center and worshipping angels kneeling on either die. Then the priest obtained the fourteen Stations of the Cross. The plaques are beautiful and unique. They are executed in warm colors and are sturdy in design with life suffusing the figures depicting the tragic course of Christ to the cross and redemption of man. The priest lead his little flock until January of 1962 when the grieving congregation mourned his death. Father S.J. Jesiolowski also a priest from Holy Trinity took the vacant post and under him was accomplished the ultimate triumph. The little mission church was declared a full fledged parish on Oct. 10 1962 and was assigned its first totally attached priest. Father Louis Schaechter Now once again, the parish is ready for another plateau of progress. Next spring the members hope to start building a new church - which is expected to cost about $285,000 - on a 10 acre tract between 7th and 9th Avenues on 17th St. in Silvis. The program has been under the supervision of Father Schaechter; Joseph Ybarra and Amadore Sierra, church trustees; William Schulte, building committee chairman; and Wilbur Allaert, finance chairman under whose leadership more than $76.000 has been raised for the new church. But the eventual leavetaking from the little church on the side of the hill will not be an easy thing. When the announcement was made that soon the new church would be built and the old one abandoned, many of the congregation burst into tears. So the little church is to be preserved in all its present beauty for the generations of children in the time to come. The ancient statue of St. Cecilia stands in a place of honor by the church door. The statue as brought to Silvis many decades ago and was on the altar of the Mexican community's first church. It will be an education center and here the children will learn their catechism take the instructions in religion and learn to celebrate properly the Mass with all its age old ritual and meaning. The carved altar, the striking Stations of the Cross, the rich ruby holders for the twinkling votive candles and the beautiful old fashioned statues will be retained just as they are now. And the ancient statue of St. Cecilia will remain in its place of honor atop the bookcase by the church door through which will reverently march the generations of children. Many of those children now are descendents of the little homesick band of Mexicans who first worshipped in a boxcar chapel in a strange land where the winters were bitter and sharp with icy cold - but which was warm with the rich faith of a people who stubbornly refused to live without God,. Two shepherds with a distinctively Slavic air frame the kneeling Virgin Mary in the background in the church creche. The figures in the creche are beautifully unique and some are portrayed in European interpretations of a medieval time.